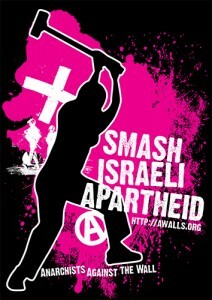 Anarchists Against the Wall, the Israeli anti-occupation peace group, is ten years old this April! Therefore to celebrate their anniversary and continue to combat damages both physical and legal to Palestinian, Israeli, and international activists that engage in civil disobedience against West Bank expansion, AAtW has called for solidarity fundraisers. So are any Food Not Bombs groups interested in putting together an “April Against the Wall” event? If so, let them know here and look over their resources section for educational material.